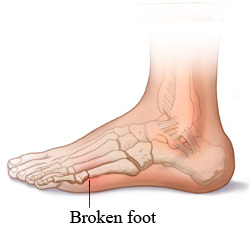 A broken foot, or foot fracture, is a break in one or more of the bones in your foot. It may happen because of a sports injury or a fall. A compound, or open, fracture occurs when a bone breaks through the skin. A break that does not poke through the skin is a closed fracture. Your treatment depends on the location and type of break in your foot. You may need a splint, a cast, or an orthopedic shoe. Certain kinds of injuries may need surgery at some time. Whatever your treatment, you can ease symptoms and help your foot heal with care at home. You may need 6 to 8 weeks or more to fully heal. You heal best when you take good care of yourself. Eat a variety of healthy foods, and don't smoke. Leave the splint on until your follow-up appointment. Do not put any weight on the injured foot. If you were given crutches, use them as directed. Put ice or a cold pack on your foot for 10 to 20 minutes at a time. Try to do this every 1 to 2 hours for the next 3 days (when you are awake) or until the swelling goes down. Put a thin cloth between the ice and your skin. Prop up the sore foot on a pillow anytime you sit or lie down during the next 3 days. Try to keep it above the level of your heart. This will help reduce swelling. Follow the cast care instructions your doctor gives you. If you have a splint, do not take it off unless your doctor tells you to. If you have a removable splint, ask your doctor if it is okay to remove it to bathe. Your doctor may want you to keep it on as much as possible. Keep your plaster splint covered by taping a sheet of plastic around it when you bathe. Water under the plaster can cause your skin to itch and hurt. You have a problem with your splint or cast. Enter J636 in the search box to learn more about "Broken Foot: Care Instructions".